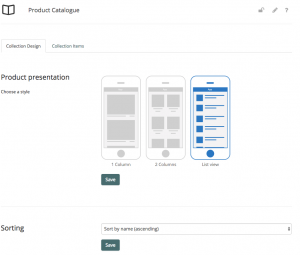 Thanks to this module, your products are displayed in a clear catalogue. The contents are added as in the price list module. 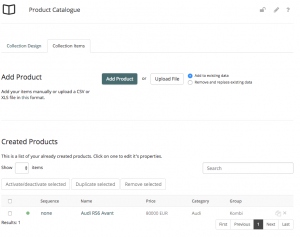 Under the design tab, you can define the layout, sorting and advanced settings of your product catalog. In the articles tab, create your products by clicking on the create product button and add names, prices and possible additional descriptions. You can also upload your products manually as a CSV or XLS file. The image material (in JPEG and PNG format) you want to use for your products must not exceed 320px x 230px.